Lost Recipes of the Wiener Küche : "Austrian Cuisine"
As stated in my introduction to Austrian Cuisine (which is Viennese Cuisine by the most common nomenclature) has developed mostly during the 18th and early 19th century. At that time, Vienna was boasting with Baroque palaces and the feudal structures of the Empire supported many big kitchens with lots of staff. It was part of Baroque etiquette to impress guests with enormous feasts that would break records in food originality. When Vienna became the focus of attention to Europe′s aristocracy during the Vienna Congress in 1814 and 1815, this year-round-party peaked in excessive decadence. But it also made the Viennese Cuisine more formalised, with the competing chefs writing down more of their techniques than ever before. At the same time, there was the cuisine of the poor. Their meals were naturally anything but opulent feasts. As everywhere in the World, the poor people of Vienna ate pretty much anything in terms of animal parts. Housewives of the 19th century working class proved to be highly creative when it came to finding edible protein on things any same nobleman would have discarded as waste. Some of Austria′s most distinct specialities owe their existence to the poverty of Vienna, such as Beuschl (consisting mostly of lung, but also trachea and blood vessels) or the legendary Leberkäse (of which you don′t want to know what it consists of). With an increasing awareness of cuisine as part of a culture, cook books were published more frequently than ever before. This meant that recipes were "formalised" and preserved for future generations. Therefore, the Vienna Cuisine was most complete at the late 19th century: Both Kaiserschmarrn and Wiener Schnitzel had been "invented" by then, both as variations of existing meals. However, if you ever have a chance to read a cook book or - even better - a collection of recipes from your ancestors (my great-grandmother was a cook) from around 1900, compare it to the menus that you find in Austrian restaurants. You will be surprised. There is a sheer endless number of recipes and traditional meals from the 19th century that is completely forgotten today. Even remote countryside Gasthäuser that pride themselves of cooking in the proper "Austrian" tradition will not serve a whole lot of meals that were every-day food only some 150 years ago. There are several reasons for this. Firstly, every cuisine changes, develops and evolves. Even if a sudden increase of cooking literature decreased the rate of change in the 19th century, it didn′t stop the evolution of Viennese Cuisine. Secondly, after the loss of its rich variety of ethnicities in 1918, Austria was deprived of much of its diversity and many dishes previously common in the eastern crown lands were gradually forgotten. Most of today′s Austrian Cuisine resembles most strongly the Bohemian tradition. Thirdly, the establishment of the "Nouvelle Cuisine" as something like an international standard of cooking transformed many techniques that Austrians used to cook in. Finally, disgust and economic improvements might have played a role - some of the poor people′s favourite bits are used for pet food today (if at all). Nevertheless, the loss of some recipes is a bloody shame and so I am always delighted to find facsimiles and reprints of old Austrian cook books. One thing that strikes you immediately is the strong influence of Hungarian and Slavonic traditions. With the Austrian′s tendency to romanticising their imperial past, several recent cook books specialise on 19th century cuisine. Therefore, it has become quite feasible to cook like an imperial chef these days. I chose the following menu, however, not from the Kaiser′s collection, but from traditional meals eaten by common people. The nobility ate the same fancy things all over Europe anyway - you have to dig into the pots and pans of the simple people, the carriage drivers, the maids, the shoemakers, the butchers and night guards to find the real deal. The meals that are distinct for a certain place and kissed by necessity (or would a wealthy person think about eating trachea?). The following is a series of neglected dishes that deserve to be remembered. Wash the tripe well and boil it briefly in salt water. Take it out of the water, dry it and cut it into small pieces. Boil water with chopped onions, parsley, carrots, some garlic, chopped bacon if available, a chopped Semmel (bread roll) and juniper barries. Add the tripe and salt with pepper. There are several variations of this soup, it was often made with béchamel and other pieces of animal (such as pig head or calf feet). Note also that the measures in old cook books were rather not very precise - it probably requires a good sense of cooking to succeed with such recipes. Take two pigeons and roast them briefly in a frying pan with some butter and a finely chopped onion and some thyme. Then add a good shot of dry white wine and two cups of soup. Boil the pigeons until they are done. In the meantime, boil three hands full chestnuts, peel them and chop them. 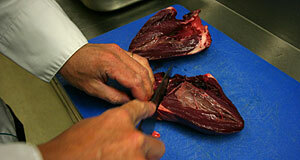 Add the chopped chestnuts and have a glass of Madeira (fortified wine) to the pigeons. Boil for another minute or two with a closed lid. Serve with roasted bread. As you can tell from the wine and - even more so the Madeira - this was a rather festive meal. Pigoens, however, were considered to be the "peacock of the common man" and available for little money in the 19th century. Soak leftover Semmeln (bread rolls) in milk and cut them into chunks. Whisk some egg whites until stiff. Mix yolks, almond flakes, some raisins, some saffron, a shot of rum and vanilla sugar. Grease a casserole with butter. Mix all ingredients in a casserole and bake it briefly. Serve the Auflauf with fruit stew or chutney. Surely sweet desserts were not an every-day feature of very poor people, but with the Austrian′s sweet tooth a crucial element of a well-rounded meal. You can tell the economic aspect of this recipe from the primary ingredient: left-over Semmeln. Note that saffron was commonly used in 19th century Vienna to make meals more "yellowish". This faked an effect that you could have from using yolks of many expensive eggs - these days, it is just the other way round: Saffron is a very expensive ingredient, whereas eggs are relatively cheap.